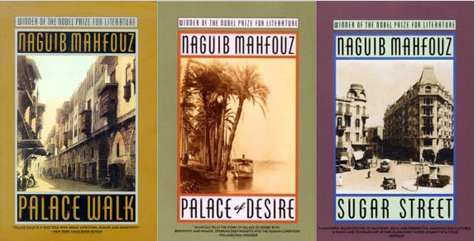 Thus begins Palace Walk, set in the early part of the last century, the first volume in the Cairo Trilogy by Naguib Mahfouz and the only book originally written in Arabic that’s included in the Everyman’s Library. The woman is Amina, an illiterate daughter of a cleric married at 14 to Al-Sayid Ahmad, a much older respectable merchant who does not allow her, ever, to leave her house (except to visit her mother a few times a year, in his company). He, on the other hand, goes out and drinks every night with his friends, and sleeps with entertainers/loose women. Both Amina and Al-Sayid are portrayed as representatives of the virtues of their society, hers femininity, submission, patience, motherhood, unworldliness, loyalty, obedience and so on. His virtues are authority, success, charm, virility, devotion to his family and a successful navigation between the spheres of public and private. A description of Amina early-on relates her perfect happiness with the conditions of her life (without this happiness and acceptance she could hardly embody the virtues she does). For the modern female reader a depiction of life trapped inside one’s house obediently serving a man is difficult to feel comfortable with, but I found Mahfouz’s prose to be so unusual, flowery, elaborate, emotional, smooth and vivid, and the quality of his descriptions of this alien world to be so enthralling that I uneasily went along with it. He uses more exposition than is considered acceptable in today’s fiction-writing, and I felt that the novel had a tranquil, roomy aura because of it. I was also fairly certain that the idyll being established would be the origin point from which everything unraveled, and in this I was right. Al-Sayid Ahmad and Amina’s strengths can also be weaknesses. When they are both in their prime they achieve a balance that works, but as their characteristics are passed on to their children unevenly, they become flaws and sources of tragedy. One son is a sensualist and a libertine (one of my favorite characters; see the night he wastedly brings a woman back to his own home and is caught by his wife); a daughter, deprived early of a husband and child, has no further psychological resources; another son is such a sheltered romantic that he becomes a fool. In the third book and third generation, one grandson becomes a fundamentalist and another a communist, and one (the most successful) is gay, a secretary to a politician and a powerful man in his own right. The repressions and false restrictions of the society don’t seem to do anyone any good, though of course I would think so. I don’t think Mahfouz is successful at making the Egyptian politics come alive, which is another major component of the books, but he does establish an aura of betrayals and bungling that’s probably something close to the truth, and the early stages of rebellion against British Colonial rule are captivating.